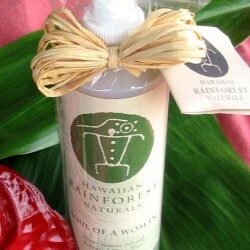 This bath gift basket lets the essence of wild bamboo orchids and gardenias from the Hawaiian Rain Forest. This spa gift will transport you to a whole new level of pleasure in your spirit, mind, and body. This Wild Orchid Pleasure Bath Gift Basket features the flower essences from wild bamboo orchids and gardenias. These have long been used by Hawaiians for healing and rejuvenation. The bath crystals are all natural and infused with essential oils. One package makes a soothing bath. Or just part of the pack for a relaxing foot bath. Wild Orchid Soap is also a natural product. This 4.25 ounce bar is made from plant based glycerin. The scent is of both wild orchid and sweet gardenia. 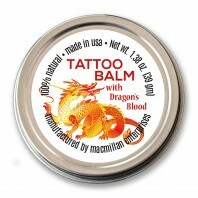 Though small the bar is long lasting and chemical free. Plumeria are long associated with Hawaii. Locals make leis or wear them in their hair. However the fragrant bloom is short lived. So we have the next best thing. A beautiful white hand fashioned plumeria on a pin for wearing in the hair. And this pin can be worn again and again. The color is white with a yellow center after the common yellow variety of plumeria tree. Gardenia is called pikake in Hawaii. It is a variety of jasmine and can be very fragrant. 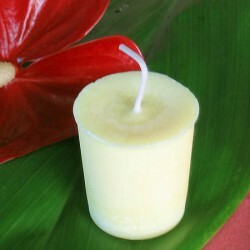 Our candle maker uses the essence of that flower to scent her hand made candles. 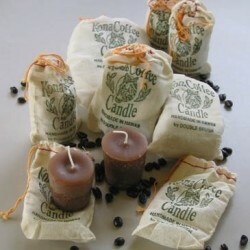 These are natural candles. That means they are made from soy rather than from petroleum. 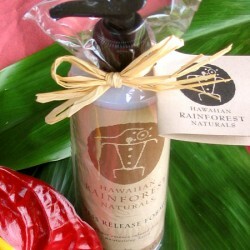 Each will fill a room with Hawaiian fragrance for 8 to 10 hours. Perfect for burning while enjoying a bath with our Wild Orchid Bath Crystals. 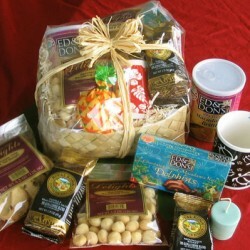 We put these items together so that you can send a special gift With Our Aloha. 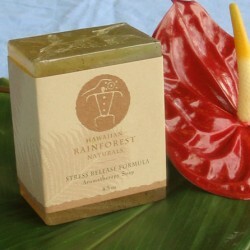 Send this to someone who deserves a little pampering and an escape to the tropic beauty of Hawaii. Our pikake oil fragrance can be used as a perfume, for aromatherapy or for crafts. Choose a natural wrapped basket or colorful gift bag. 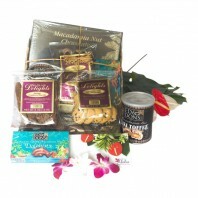 Also available for free delivery in Waikiki.